Taking a bite.... Words on wine and food, plus cycling, music and other cultural phenomena. The poultry, egg, lamb and pork purveyor at my local farmers market sells turkey pot pies. In the world of farmers markets, such an item is referred to as a “value added product” – something that’s not a direct product of the land or farm but is produced (or processed) from the farm’s goods. The pot pie has become a near weekly habit for me since its introduction at the market last year; in a way that’s odd, as there’s really nothing outstanding or out of the ordinary about the pies. They’re about as simple as simple gets: a reasonably good pastry crust filled with chunks of white and dark meat turkey, potatoes, onions, peas, carrots and a somewhat bland, creamy sauce. It’s that simplicity that makes them work so well for me. Not only are they satisfying; they’re also a perfect foil to any number of styles and varieties of wine. Satisfying and wine friendly? That’s my kind of value added product. Last week’s pie paired quite nicely with…. $30. 13.5% alcohol. Cork. Rosenthal Wine Merchant, New York, NY. Puffeney’s wines may be a little pricey for a typical midweek repast, but I’ve been on vacation the last couple of days so I figured why not give myself a treat. Straight from the bottle, this is lean and firm in both acidic and tannic impact. Its color is a completely transparent, pale ruby, tinged green/orange at the rim. With a few moments to settle, aromas emerged of red tea, rose petals, teak and tart cherry fruit. Like its color, the wine’s flavors are delicate but intensely penetrating. If you’ve been looking for a “light” wine to serve with hearty fare – think duck, beef daube or, why not, pot pies – this may be your ticket. At its initial serving temperature, I found the aromas and texture a tad off kilter so I put the bottle out on the porch for a while (on what was probably one of the last cool nights of the season). Sure enough, at a slightly cooler temp – and no doubt helped along by a little more air – the wine felt gentler and found its focus. Scents of potpourri and spice were even clearer. And the wine’s natural acidity magnified and built upon the flavors of the meal. If you’re looking to try a bottle and happen to be in a hurry, decant it. After an hour, it was even more openly tasty, closer to what I remember from my last tasting when the wine had clearly benefited from some time in the glass. It bears repeating from that occasion, by the way, that, “’M’ is one of two cuvées of Poulsard produced by Puffeney from all of 1.2 acres planted to the vine on his property. 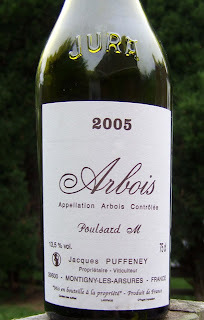 It’s named for Jacques’ daughter Marie, who favors a fruity-style expression of Poulsard.” It also bears adding that Puffeney’s Poulsard undergoes 15-20 day fermentation in tank, followed by malo in old oak foudres. The wine is then barrel aged for 24-30 months, depending on the vintage, before being bottled with neither fining nor filtration. I wasn’t quite as enamored with “M” on day two, as it faded more quickly than I would have expected. The aromas were still quite enchanting – red apples and apple skin, more teak and a whiff of sunny beach and ocean air (perplexing given the wine’s mountain origins). However, the wine had lost some of its nerve and complexity; its tension had completely relaxed, almost gone slack. Lovely red fruit kept it from being a complete let down, though. Not a bad treat, all things considered, and definitely a fine companion to two days of pot pie. Interesting, Cory. Reminds me of the J-P Brun Morgon I wrote up some time ago. Needs air to show its best but is fairly quickly eaten up by its own hunger. This work is licensed under a Creative Commons Attribution-NC-ND Works 3.0 Unported License.